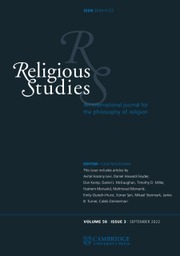 Keep up-to-date with the latest research from our religious studies journals by activating free content alerts. Simply sign in to Cambridge Journals Online and select 'Content Alerts' from the 'My Cambridge Journals Online' drop-down menu to the left of the screen. Select the option 'Add content alerts' and choose the subject area or individual journals you wish to receive alerts from. If you don't have a Cambridge Journals Online account yet, you can register for one here.